When it comes to famous Dutch dudes painting harassment scenes, Vermeer doesn't disappoint. This painting looks exactly like Vermeer's The Glass of Wine, yet creepier. The poor woman's face clearly screams "hurry up already! ", it makes you wonder what the hell Vermeer was thinking. Was he trying to depict an innocent scene of two lovers sharing a glass of wine, but did his male model decided to start acting all creepy? Or did Johannes just have a thing for predatory scenes? Experts aren't sure either. Arthur K. Wheelock Jr, curator of the Northern European Art Collection at the National Gallery of Art says it's clearly the guy who's being seduced. Her smile indicates that she's aware of the situation and knows she's in control. Uhh ok. Other critics like Walter Liedtke, former curator of Dutch and Flemish Paintings at the Met, say it's the girl who's the "romantic victim". 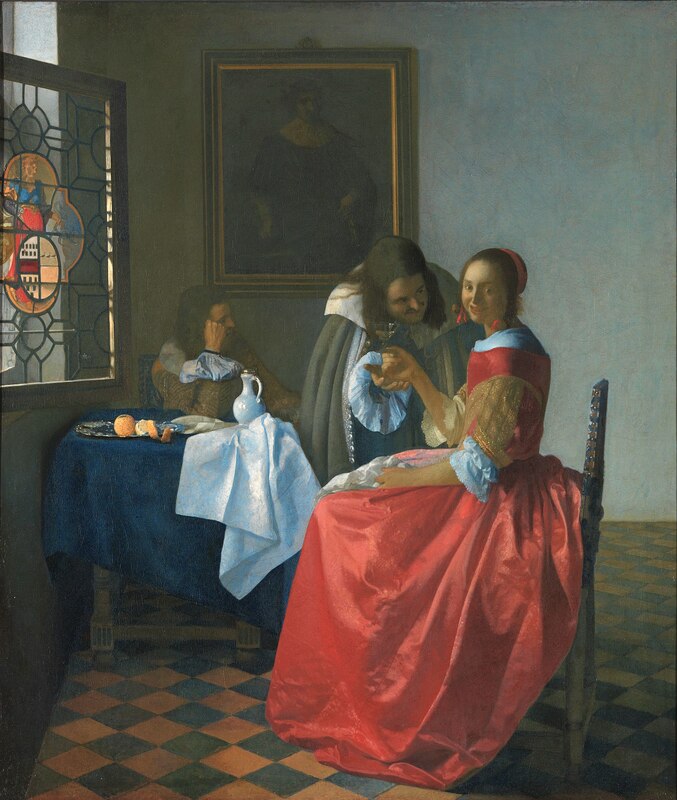 I ain't no Vermeer expert, but if one of my friends pulls this face there's no doubt in my mind the guy creeping on her deserves a kick in the nuts asap. Something the guy in the back should consider doing, but up until this moment he chooses to not get involved. The stained-glass window on the left is a coat of arms that has been identified as Janet Jacobs. It would make sense if she was the lady who modeled for this painting, if it wasn't for the fact that she died before Vermeer was born. The symbolic meaning of the coat of arms might help us understand what's going on in this painting though. You can clearly see a woman holding a level and bridle which means she represents Temperance, a virtue defined by stuff like moderation, self-control and non-violence. The girl is obviously controlling herself from something, whether she's leading him on or trying not to punch him in the face, we will never know!